(L to R) George “Bud” Reams, Mayor Jim Ledford and Bill Norris. PALMDALE – Palmdale Mayor Jim Ledford was presented with the prestigious North Star Award from the Boy Scouts of America for distinguished service to youth at the Feb. 6 City Council meeting. 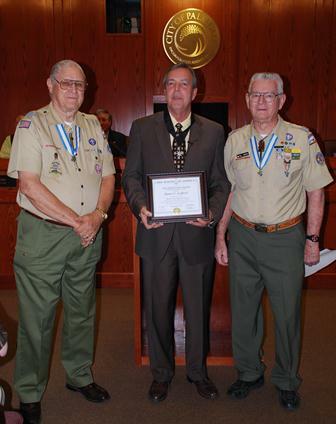 Ledford was presented with a certificate and the medal by Bill Norris, Advancement Chairman of the Antelope Valley District of the Boy Scouts of America and Troop 444, and George “Bud” Reams. According to Reams, the presentation of the North Star Award was the first time it has been presented by the Western Los Angeles County Council and in the State of California. 1 comment for "Ledford awarded North Star Award"
Jimbo is looking good after his recent past heath problems, that’s great.